Challenge yourself in exciting Radio Control races in the best driving simulator. Ride extreme speed boats in this arcade RC racing game! Perform stunts, avoid obstacles, collect and upgrade all the power boats and drive to victory in a power boat racing game. Ready… Steady… GO! 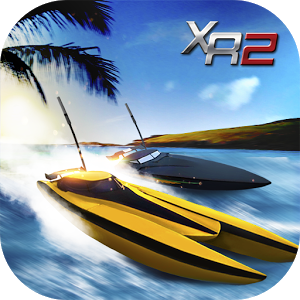 The competition is hotting up – so download Xtreme Racing 2 - Speed Boats for FREE and get racing! Accelerate to top speed, run across the water of the sea and jump over your rivals in this frenetic racing game. Drive over the marks on the water to get nitro and sprint to overtake the other pilots and win the grand prix! Get the best score driving faster, getting nitro boosts, doing amazing stunts and jumping higher than your rivals! 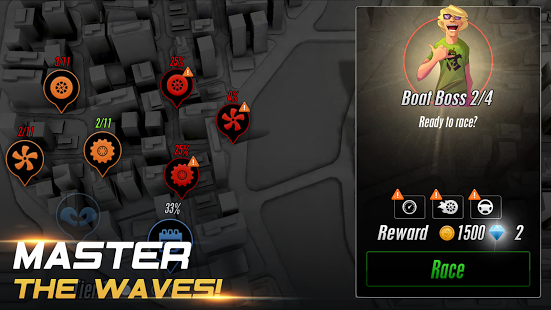 The sheer variety in boats, opponents, tracks and environments makes the game feel constantly challenging, fast and furious. A fast, fun and furious chaotic racing game. Hit the gas to the end to splash the water and overcome the rivals in crazy races all over the sea. Dominate all the circuits and win all the championships, personalize your crafts with the rewards and upgrade your ships. Drive mini RC Speedboats and tune them as you like with tons of customization possibilities at the workshop. Avoid the other vehicles or try to hit them in your way to the first position of the championship. Hitting the water in a power boat, nothing compares. What about visit the Garage? Upgrade the engine and increase the top speed of your jets, or level up the blade to get more hidrodynamics, or boost the spoiler to improve your stunts, or maybe you want to enhance the chassis and make your craft bigger and unstoppable! Push your driving skills to the limit in the Limited-Time Events or challenge your friends in Multiplayer mode. Only the bravest and skilled drivers will reach the victory in the speedy races of this RC racing game. Be the most furious racer and drive full speed drifting fast and doing burnouts. Hit the gas and burn that ship as a real jetpack! Race fast as lightning in the ultimate pro boat driving experience! Level up your driving skills after every race, become the champion in this Radio Control Driving Simulator. Upgrade every aspect of your speed boat – chassis, tires, engine, body, spoiler as you progress through your racing career. Set the right engine and tune the turbo and no one could beat you on the track! Customize your ride with stickers and new paint jobs. Dazzle your opponents with colors and awesomeness! Go to the garage, pimp your jet the way you like and be the most respectable driver of the city! 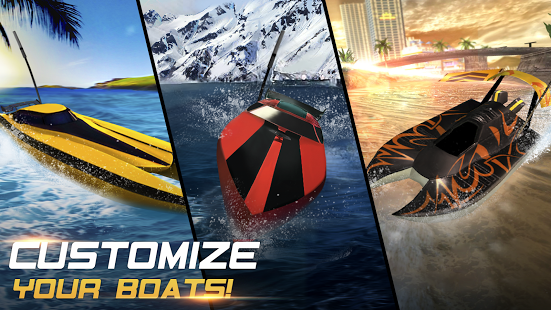 Collect all the speed boats and power boats and personalize them with tons of accessories. Don’t drive alone. Compete in awesome Racing against the world, challenge your Friends or face your boat with random rival crafts in the new multiplayer mode. Feel the speed as you participate in Limited-Time Events to stack up amazing & exclusive rewards! Can you reach the top of the World Ranking in the best boat racing game ever? 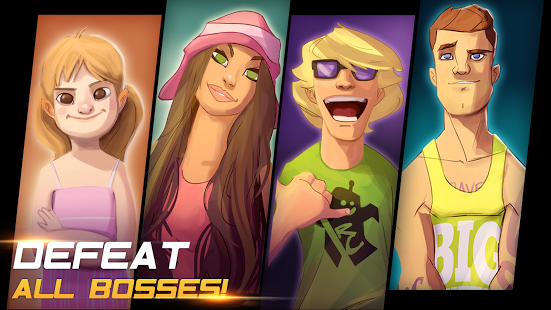 Defeat a great cast of wacky and memorable bosses as you progress from an R/C rookie to a global legend! Use the nitro to boost the speed and overcome all the opponents. Try crazy stunts to leave the other in the roadside! Jump and fly over the rivals! Are you going to land above them? Send them away from the road! Unique control system means anyone can learn to play in seconds - whether you’re a novice player or die-hard gamer. Easy to play, hard to master! Are you ready for extreme velocity? Get in the ship, put on the seat belt, heat the engine and hit the throttle to the end! Run/race faster and jump higher in this exciting R/C drive simulator. This is real racing genius, totally addictive!